Such claims about the English language are often repeated but rarely examined. Professor Lynne Murphy is on the linguistic front line. In The Prodigal Tongue she explores the fiction and reality of the special relationship between British and American English. By examining the causes and symptoms of American Verbal Inferiority Complex and its flipside, British Verbal Superiority Complex, Murphy unravels the prejudices, stereotypes and insecurities that shape our attitudes to our own language. With great humo(u)r and new insights, Lynne Murphy looks at the social, political and linguistic forces that have driven American and British English in different directions: how Americans got from centre to center, why British accents are growing away from American ones, and what different things we mean when we say estate, frown, or middle class. Is anyone winning this war of the words? Will Yanks and Brits ever really understand each other? Lynne Murphy is Professor of Linguistics at the University of Sussex. Born and raised in New York State, she studied Linguistics at the Universities of Massachusetts and Illinois, before starting her academic career in South Africa and Texas. Since 2000, she has lived in Brighton, England, where she has acquired an English husband, an English daughter, and an alter ego: Lynneguist, author of the award-winning blog Separated by a Common Language. "No one knows how to navigate the transatlantic language divide better than Lynne Murphy. Moving beyond facile stereotypes about British and American English, she delves into subtle linguistic nuances with wit and aplomb. 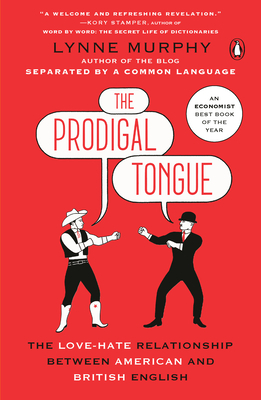 The Prodigal Tongue is a wonderful reading experience for anyone interested in understanding the true nature of these two distinct 'nationlects.'"